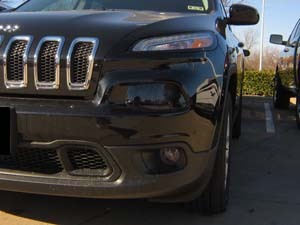 Protect the lights of your Jeep Cherokee with Headlight Armor lighting protection film kits. Great accessories for your vehicle. Choose our nearly invisible classic clear headlight savers for protection without changing the look of your vehicle, or choose one of our colored / tinted versions to add some style with the protection. Colored options include HID Blue (shines bright white), GT Yellow, and several levels of Smoke. 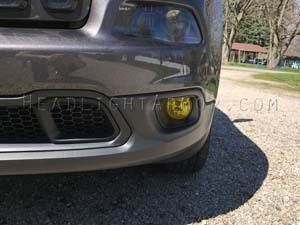 Protect your headlights signals fogs with our Clear, HID Blue, GT Yellow, or Smoked film covers. 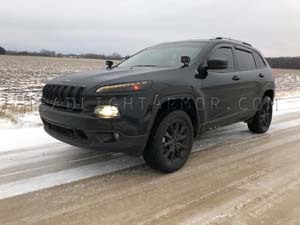 These are manufactured to fit your 2014, 2015, 2016, 2017 or 2018 Jeep Cherokee. Includes relief cut for sharp ridge at the inner corner of the signal lamp. Protect your lights with our Clear, HID Blue, GT Yellow, or Smoked film covers. These are manufactured to fit your 2014, 2015, 2016, 2017 or 2018 Jeep Cherokee. Includes relief cut for sharp ridge at the inner corner of the lamp for easier install.